Chatting the other evening with dedicated London Walker David Hall. He looms large in the London Walks legend, does David. Hopefully one day LW's own David Tucker, his big pal, will relate the tale for this blog of how David H and his wife Margie were instrumental in setting the good ship London Walks on its current course. David (Hall) was reflecting that he has now reached an age that Franklin D Roosevelt never saw. "I'm now older than FDR was when he died, and I've achieved considerably less. Even with the extra years," he laughed, "I'll still achieve considerably less!" It made me think of George Du Maurier. Funny what makes the synapses connect and spin an unexpected platter on the great jukebox of the subconscious isn't it? 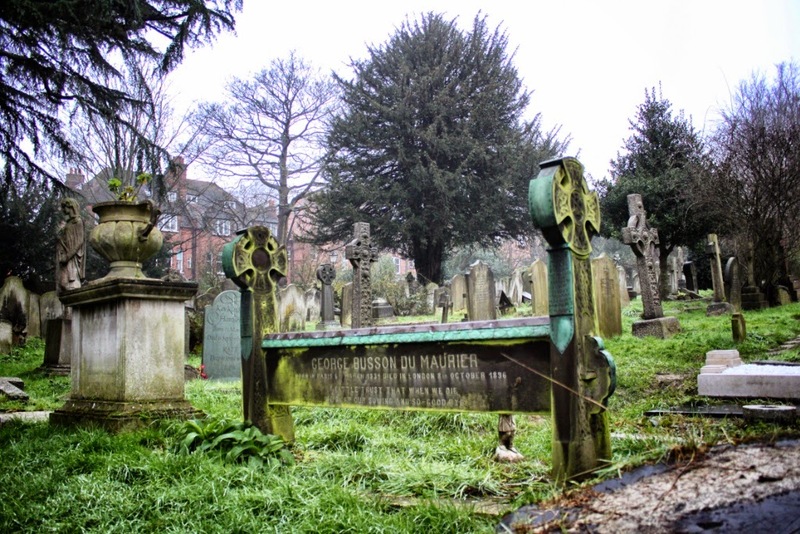 Whenever I am guiding the Hampstead Walk, I always try to look at Du Maurier's grave. Du Maurier wrote (among other things) Trilby, a novel set in fin de siècle Paris, peopled with lurid showbusiness types (the best kind of showbusiness types, o'course) among them a young singer named Trilby and an evil and manipulative showbiz manager named Svengali – from whence we get the metonym for evil and manipulative showbiz managers in general. Simon Cowell, I suppose, is the closest thing we have to such a thing today. Talk about the paucity of genuine characters in the 21st Century. 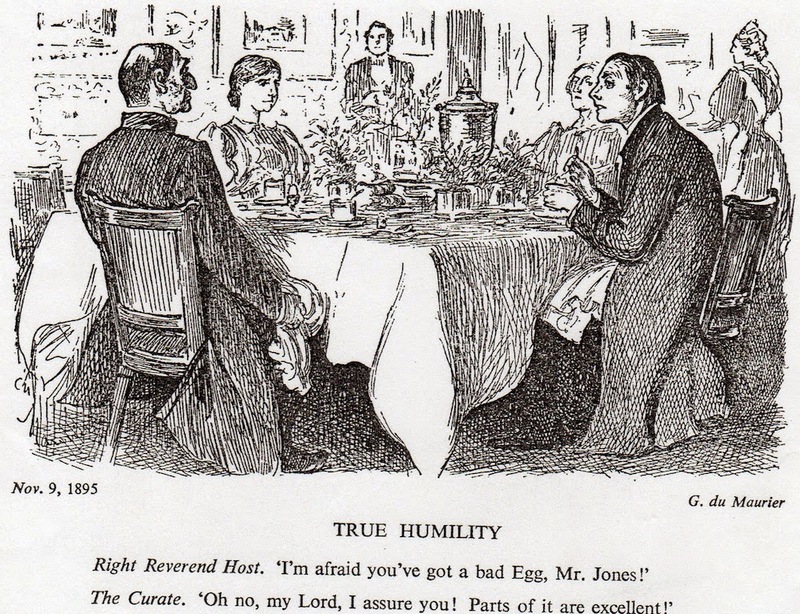 "I'm afraid you've got a bad egg, Mr. Jones," says the bishop. The curate replies, "Oh, no, my Lord, I assure you that parts of it are excellent!" And thus the phrase "Something of a curate's egg" (so beloved of arts critics) enters the language: a piece that is perceived by the critic as mainly bad with one or two perhaps questionable redeeming features. But back to David Hall. David's rumination on FDR and everything he achieved sent me off to du Maurier for the following reason. George du Maurier was a busy boy too, one of those Victorians who seemed to have cracked the secret of the 25 hour day – not content with success in one field (cartooning), he conquered a second (fiction) in later life. He is buried at St John at Hampstead in North London (pictured above). In a pleasing chime the ashes of Peter Cook are interred nearby. 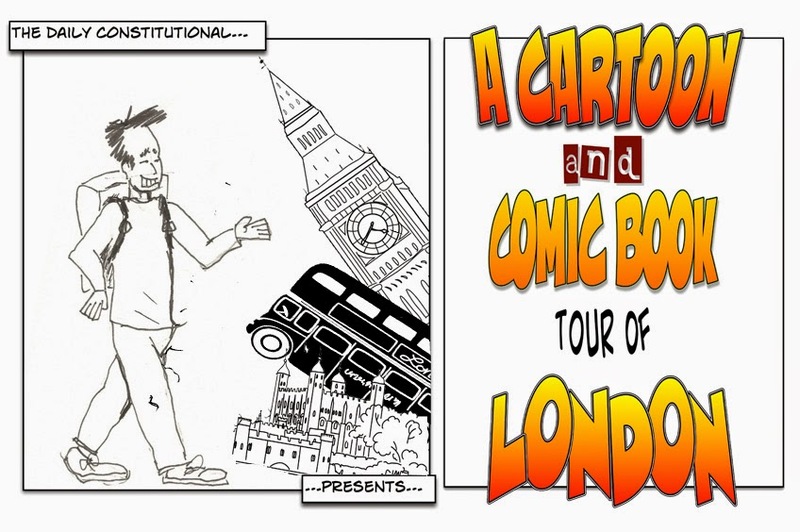 Cook founded our greatest repository of the cartoonist's art (in fact our only one left!) Private Eye magazine (more on that another day). And while we're talking about the neighbours, look at the grave to the left of du Maurier's, marking the final resting place of the cartoonist's fellow perpetual Hampsteadite, Labour Party politician Hugh Gaitskell. Gaitskell’s likeness was captured many-a-time by legendary political cartoonist David Low in The Evening Standard. Low kept a studio in Hampstead just around the corner from St John's. He'll be back later in our series, too. You can join us on the Old Hampstead Village walk every Wednesday and Sunday. Full details at www.walks.com. Next time, something a little more up-to-date: alternative history with Churchill, Alan Turing and London laid waste in the ongoing comic book series Über. In the meantime you can catch up with Part One (on Hogarth) HERE.